Buuble.net is the PUP that uses misleading techniques to prevent removal. Use Reimage to locate malicious components and get rid of them faster than with uninstall instructions. A full system scan blocks virus reappearance and prevents traffic to malicious domains. Is there a way you can avoid being infected with this malware? This year, browser hijacker viruses have been more active than ever and buuble.net virus only one of the hundreds of similar programs that are being released every day. A frequent problem with these questionable programs is that they often propose quite useful features. Buuble.net, for instance, is a browser extension that allows the users to access their favourite applications, programs and social media sites directly from their homepage using a toolbar pinned to the top of search engine’s window. This might be an useful application improving the users’ experience but in reality, this application is merely a bait for unsuspecting users to download an ad-driven virus on their computer. As soon as the program is installed, besides the changed homepage and default search engine, the changes will start occurring on your browser as well. Pop-ups, banners and sponsored links will start appearing within your Edge, Google Chrome and Firefox browsers, overlaying the original content of your visited websites and interfering with your overall browsing. Frankly, there is no use keeping this program installed on your computer, so do not hesitate to remove Buuble.net right away. Professional antivirus utilities, such as Reimage will fully eliminate the threat leaving no suspicious files unexamined. As we have already mentioned, this application can be downloaded directly from the official website on which it is promoted. A more common way this program finds its way on the user’s computer, though, is by using deceptive techniques, such as “bundling”. This strategy allows potentially unwanted programs to hide in legitimate software’s installation settings and install without requiring a direct permission. But the stealthy hijack is not even the worst aspect of this suspicious application. More dangerous features of this program are related to the Buuble.net ads it generates on the infected computer browsers. Since this hijacker is primarily oriented towards money-making, there is not much selection of what it chooses to advertise. Therefore among the completely legitimate links and ads there might also be domains, products or services that should better be bypassed. The worst part is – you never know which one is which. Naturally, the innocent-looking ads by Buuble.net are not only annoying but may be dangerous and infectious as well. Buuble.net removal takes time and can even result in the virus bouncing back to the computer if not carried out properly. To save yourself from this unpleasant, time-consuming experience take time to equip your computer with reliable protection and analyze your own browsing habits. Yes, a major part of your system’s safety depends on how you browse the Internet. If you recklessly download unknown programs or visit suspicious, unreliable websites there is no wonder that sooner or later you will be infected with some malware. It is important to be cautious of what you allow to enter your computer as well as try to stay on the safe side of the Internet, instead of dwelling into the insecure and infectious domains. Absolutely. You should get on with the Buuble.net removal as soon as you have the chance. This application is quite useless and may expose you to different security risks, so a secure computer should not have it running in the system. There are several techniques you can use to remove Buuble.net manually. All the methods are described and illustrated in detail at the end of the article. Although if quick virus removal is your goal, we recommend obtaining an acknowledged antivirus utility and leaving the infection for the professional software to take care of. Here, look for Buuble.net or any other recently installed suspicious programs. Wait until you see Applications folder and look for Buuble.net or any other suspicious programs on it. Now right click on every of such entries and select Move to Trash. When in the new window, check Delete personal settings and select Reset again to complete Buuble.net removal. Once these steps are finished, Buuble.net should be removed from your Microsoft Edge browser. Here, select Buuble.net and other questionable plugins. Click Remove to delete these entries. Now you will see Reset Firefox to its default state message with Reset Firefox button. Click this button for several times and complete Buuble.net removal. Here, select Buuble.net and other malicious plugins and select trash icon to delete these entries. Click Reset to confirm this action and complete Buuble.net removal. 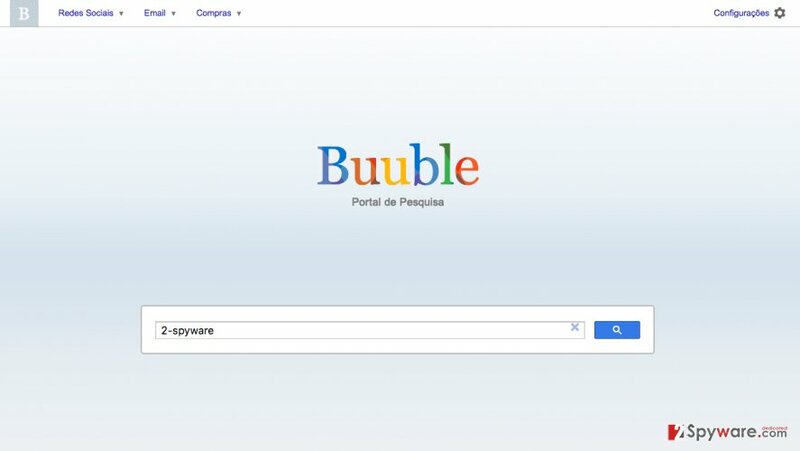 Here, select Extensions and look for Buuble.net or other suspicious entries. Click on the Uninstall button to get rid each of them. Here, look at the Homepage field. If it was altered by Buuble.net, remove unwanted link and enter the one that you want to use for your searches. Remember to include the "http://" before typing in the address of the page. Now you will see a detailed dialog window filled with reset options. All of those options are usually checked, but you can specify which of them you want to reset. Click the Reset button to complete Buuble.net removal process. This entry was posted on 2016-07-26 at 03:50 and is filed under Stealing programs, Viruses. You can quickly scan the QR code with your mobile device and have Buuble.net virus manual removal instructions right in your pocket. How did you remove Buuble.net virus?